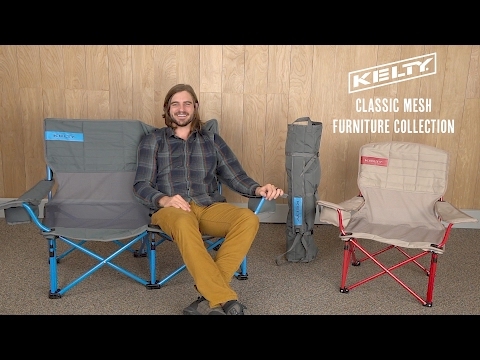 The Kelty Low-Love Mesh Chair is a super-comfy folding chair built for two. The mesh backing keeps air flowing so you stay cool even if things start to heat up. Perfect for all-day summer festivals or getting cozy around the campfire, the Mesh Low-Love features dual insulated beverage holders, adjustable arm rests, a slightly reclined seat-back, and a durable steel frame. Plus, the Roll-Tote carry bag makes the chair easier to pack and doubles as a firewood/gear tote. Although it’s Built to Wander, the Low-Love will graciously accept a front porch retirement after seasons of use. Compact and lightweight yet sturdy construction. Super comfortable. Can’t ask for anything more than that! Easy to pack back in to its carrying case. We've had double camp chairs over the years. This is a great version. Height is JUST a bit higher than our favorite music venue allows but nobody has hassled us so far. Bought the mesh simply because the original was out of stock. On a hot summer day we were happy to have it. You can actually feel the breeze. Solid construction. Carrying bundle is easier than trying to stuff it in a sack. Also allows you to roll an umbrella or similar up into it. I bought this with high hopes, and it delivered, even when the delivery itself had a hiccup. I ordered this for the renaissance festival season, since it starts cool, and ends hot, and we go for 8 weekends straight. My girlfriend is super short, so she appreciates the low height, and I set up a hookah lounge while I'm there, and this chair is the perfect height for the nice low table I use. When it shipped, there was a hole in it, the carry bag was straight up torn, and there was a worn/burned looking spot on another part. When I contacted Kelty, they made it right in less than a week, and we are completely pleased with the chair.